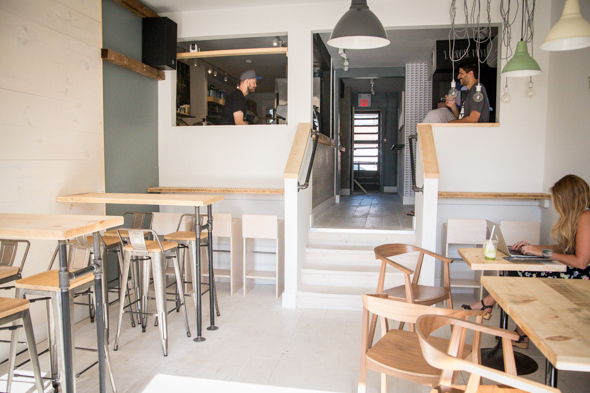 Spark, formerly Fueled Espresso and Fresh Bar, opened across from the Ossington subway station in place of an old convenience store. 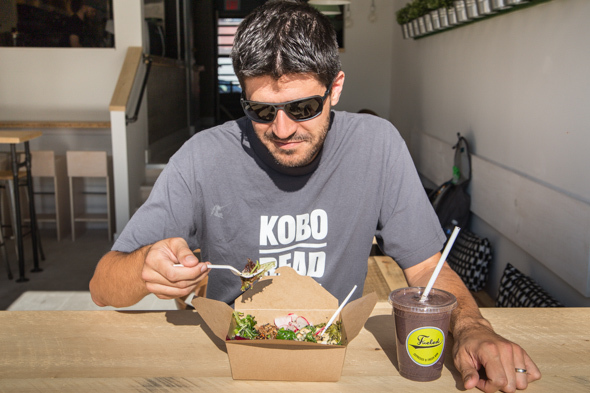 It offers commuters a bit of morning zing caffeine, fresh juice or smoothies, or stop by later in time for lunch and dig in to one of their rice boxes or hearty salads. It's a good location for something like this, a place to pick something up to go, or settle in and work 'from home'. Their coffee, which uses Pilot Big Bro beans run through a Simonelli machine, has that characteristic rich, nutty taste. Their pricing is standard: espressos are $2.62, and Americanos, $3.02. 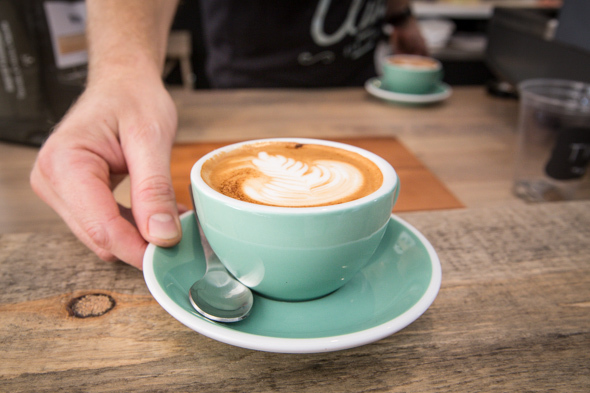 Cappuccinos and flat whites are $3.33, while a latte is $3.80. Try to linger instead of taking your brew to go, as the space really invites a hang: Bleached wood, sleek cafĂŠ chairs and stools and, when it's warm, a garage door that opens and lets in fresh air and the bustle of the city. 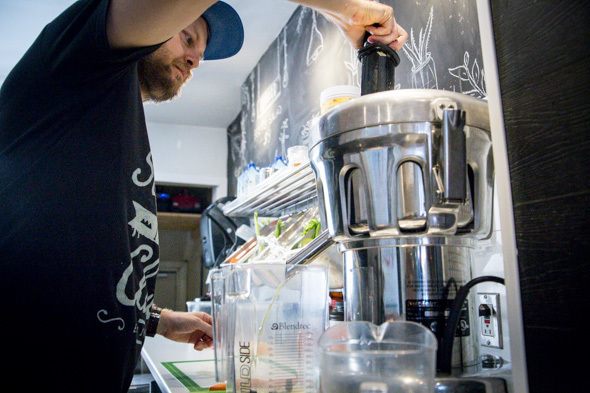 They use a centrifugal juicer - not as fancy as the cold-press styles around Toronto, but the results are still fantastic. I tried the Super Hero (16 oz. for $6.60), a blend of cucumber, apple, pineapple and fennel, and it was bright, clean and refreshing. The Strictly Green is perfect for health nuts, with its kale, cilantro, cucumber, celery, lime and ginger combo. 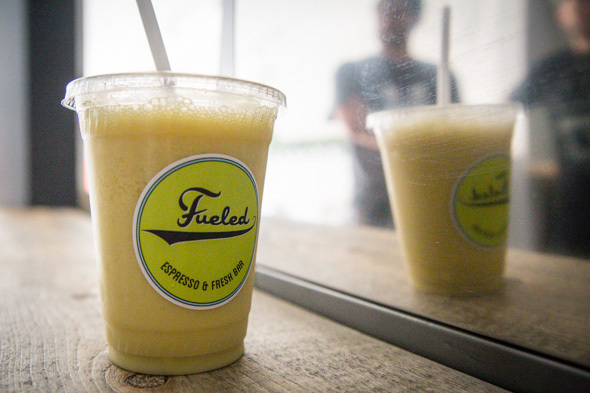 The real knockout was the Silk smoothie, which mixed orange, apple, lemongrass, mango and almond milk. I've had a few smoothies in my day, especially with this gig, but I can honestly say the Silk was the most memorable. The blend sent my taste buds right to the tropics, a most luxurious trip. Another wild combo was the Purple Velvet smoothie- cucumber, blueberries, banana, chocolate and almond milk; sounds weird, but tastes awesome. As for food, the boxes act like rice bowls on the make. 'Earth' has rice, lentils, roasted napa cabbage, figs, cashews, radish and scallions with a tahini dressing ($12), while the signature 'Fueled' includes roasted sweet potatoes, zucchini and mushrooms, spicy cashew cream and a ponzu tamari dressing. I tried the 'Beets' salad ($10) with mixed greens, pickled beets, spicy cashew cream, marinated mushrooms, fennel slaw, figs and cashews with tahini dressing. 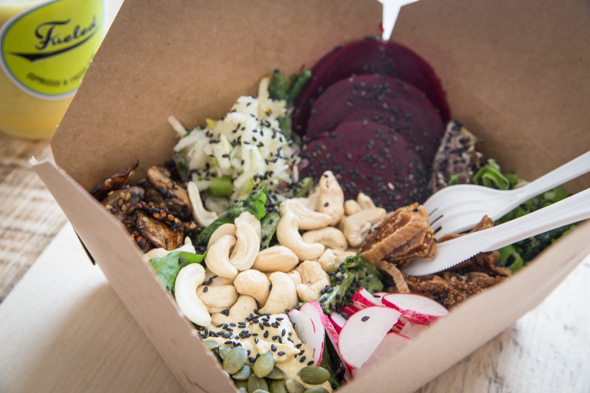 It was healthful, dynamic and filling, perfect eating on the go, or for a recharge. 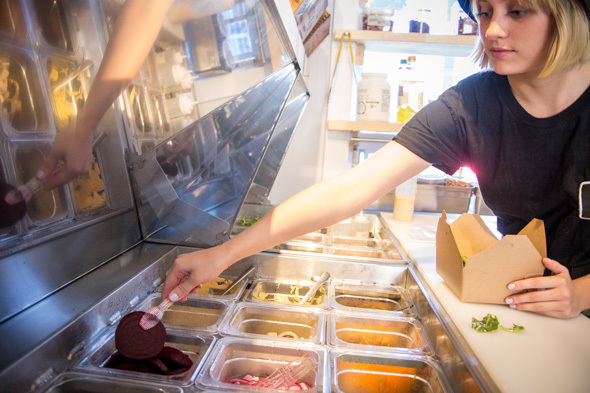 If you are on the subway and hungry, get off at Ossington and hit up Spark. If you happen to live or work in the neighbourhood, consider yourself just plain lucky to be able to stop in any time. 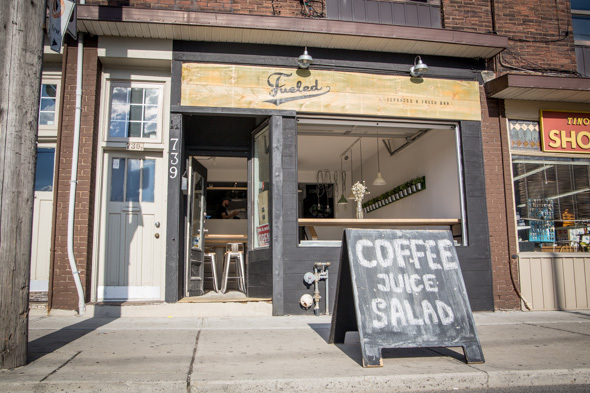 NOTE: This post has been updated to reflect the name change from Fueled to Spark.